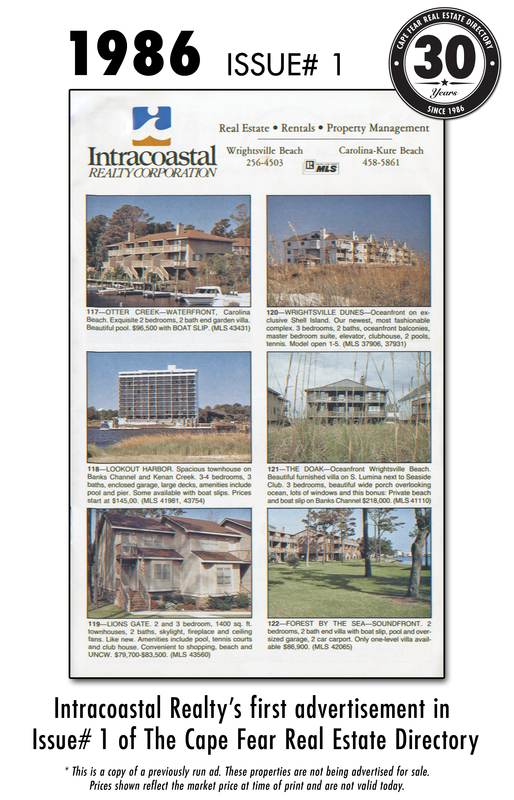 The first Intracoastal Realty advertisement was in the premier issue of The Cape Fear Real Estate Directory. In 1986 Jack Davis approached Jim Wallace, owner of Intracoastal Realty, with a notebook paper mock-up of The Cape Fear Real Estate Directory. Jim said he'd take a page and, having never missed an issue in 28 years, Intracoastal retains a strong presence in our publication today. In 1986, Intracoastal Realty had one office with 10 agents. Today they have grown to seven offices with 300 agents, and serve New Hanover, Brunswick and Pender Counties.